Henry James Munday was born on the 8th of February 1925, into a traditional pioneering timber family. His father Jack was a competitive Axemen and worked in the timber industry all his life. Henry followed in his father’s footsteps earning the skills of axe and saw sharpening as well as inheriting the fundamentals associated with the competitive sport of woodchopping. He commenced woodchopping as a competitor at the early age of 15 at Wilmot on the North West Coast in 1939. Since then he has dedicated much of his time to the sport over a period spanning 7 decades. 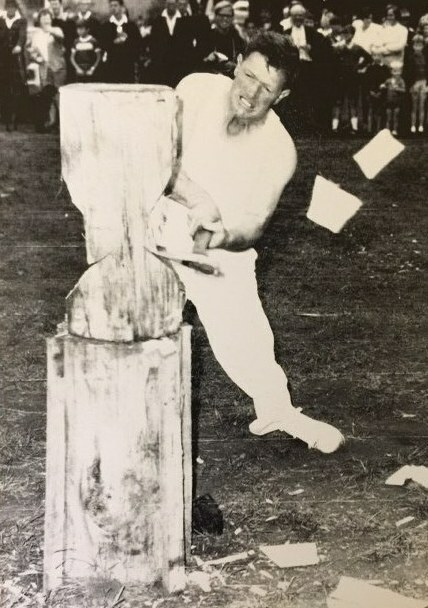 During that period of time he has competed at carnivals in the North Western Tasmanian Axemen’s Association and throughout the state experiences success in all disciplines of the sport. Tree-felling was possibly his greatest love, learning the finite skill from the famous pioneer of tree-felling competition, the late Henry Smith. He experienced success in the field of the sport in almost every state of Australia but his most satisfying wins were the 5 victories at the time honoured Burnie New Years Day Carnival. he also cherishes his victory in the Henly Foot in 1985. Henry traveled the mainland woodchopping circuit winning events at every Royal Show form 1960 to present day. One of Henrys most lasting memories of the sport is the 1979 Australian Touring Axemen’s Team, of which he was a member performing exhibitions at Royal Shows in England and Wales as well as performances in Germany. Henry spent much of his time perfecting the art of axe preparation and many of his axes have been used with success by a number of the world’s top axemen. Henry who turns 85 in February this year continues his great interest in the sport and attends most local carnivals and many interstate Royal Shows. 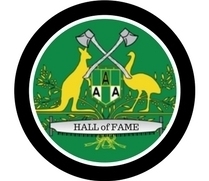 His axe and saw preparation and woodchopping skills have been the trade mark of a long and dedicated association with Australian Woodchopping.